1958 Balsa Malibu Pig 8 ft 8"
Joined balsa planks - 8 blocks each 3 3/4'' to 4 3/4'' wide. 5 blocks wide with the centre 3 blocks doubled. Bottom: Rolled belly, flat in mid section, rolled at fin. Rails: Soft round, lower in tail. .8 1/2" x 10"(base) plywood with glass bead. Modern foil with concave rear.See image below. 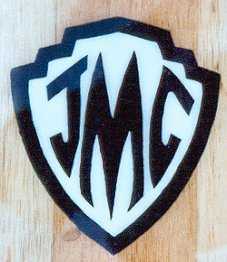 .8 1/2" x 11"(base) redwood with glass bead, branded J. C. - base at rear, both sides @1/2 inch. See image left. Pre restoration... unknown. See History, below. Restoration # 1 : clear with black pinlines and two offset thin cigar bands. Restoration # 2 : Shield JMC , green and white at sweet spot. Handpainted.Image right, top. 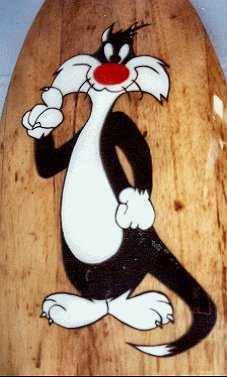 Restoration # 2 : Sylvester the Cat (Warner Bros.) Black, white and red on nose. Handpainted. Image below. Board/blank found by Shane Finch with no fin and remnants of laminated fibreglass. Brown house paint had been applied. Restoration # 1 by Bruce Hennessy /Crooked River Surfboards. Paint and remnant fibreglass removed, although some paint has seeped deeply into the timber. A pine block added to the fin base area and the board reglassed with unsuitable decals. 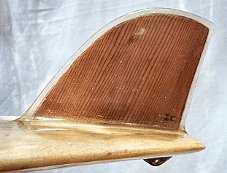 A foiled plywood fin and resin pinlines were also added. See images below. Purchased 9 July 1997/8, from Shane Finch, Berry. Restoration # 2 by Geoff Cater. 3. pine wood insert under fin removed and replaced with balsa wood. 4. Multi delaminations removed and repaired. 5. Board laminated 6 oz. and filler coated. 6. Redwood fin and leg rope tab fitted. 7. Hand painted art work by Geoff Cater and Lesley Speed. 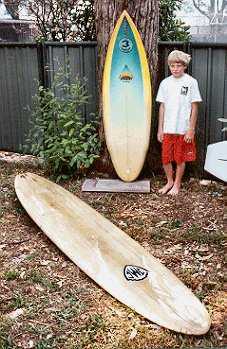 8.Finish coat and polish by Jackson Surfboards, November 2001. 7. Board gifted to James Merrick Cater, 24 December, 2001 - image below. Common Malibu Pig board circa 1958 - origin unknown. Laminated blocks and shaping indicate professional model. Ron Perry and a Balsa Hawaiian board. Ross Renwick and Gordon Woods Surfboards Balsa Pig. This board was purchased in 1956 from Bob Burnside, a member of the visiting US-Hawaiian Team for the Melbourne Olympics. Wake Ward of Hawaii with Foam board. Pollard The Australian Surfrider page 28. We are doing a book on my husband, Ron Perry, and his adventures as a traveler and dealer in New Guinea art. We do not have any photos of him with his Octopus board. 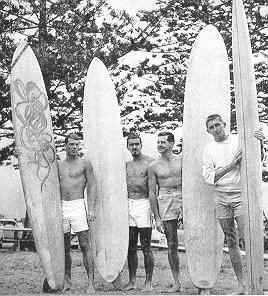 We would like a contact to perhaps get a copy of the photos taken by Ron Perott that were used in the two surfing books - Board Portrait, Dee Why, 1957. Ron's board was made for him by Allen Chang in Hawaii, fiber-glassed and painted by Danny Mack. His roommate there was Buzzy Trent. He and Al dived professionally. Ron immigrated to AU in December 1958 after he came back from Korea. He stayed in surf clubs in Sydney and Surfers and repaired fiberglass boards to pay for his rent. He left on a hitchhiking trip through Asia in November 1959, so the photo is probably from 1959. His son, Scott, loaned the board to the exhibition in Surfers.